Parkland, Florida – Following news of Wednesday’s (February 14) deadly mass shooting at a South Florida high school, several members of the Hip Hop community expressed shock, and offered thoughts and prayers to the victims. Several rappers hailing from Florida have been vocal in their response to the shooting, which left 17 people dead. XXXTENTACION and Juicy J were among the Florida rappers to express their condolences on social media. “RIP to victims & prayers up for the families in Fl,” Juicy J tweeted on Wednesday. 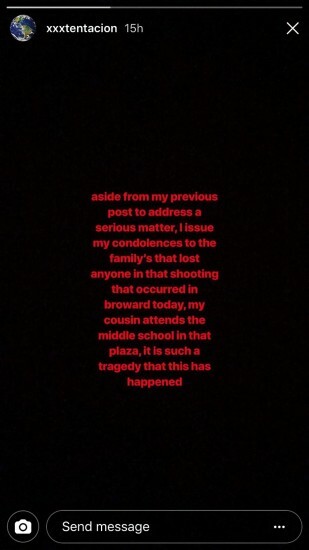 “I issue my condolences to the family’s that lost anyone in that shooting that occurred in broward today, my cousin attends the middle school in that plaza, it is such a tragedy that this has happened,” XXXTENTACION wrote in a post uploaded to his Instagram stories. 2 Live Crew alum Luther “Uncle Luke” Campbell offered his support, and called for political action. Outside of Hip Hop, the outcry following this latest mass shooting in the United States has been swift, with celebrities like Marlon Wayans and Kim Kardashian West questioning what the government plans to do to prevent future tragedies. “Is ANYFUCKINGBODY IN OUR WHITE HOUSE OR CONGRESS PLANNING ON TAKING ACTION TO TIGHTEN GUN LAWS!!!! How many mass shootings must we endure before something is done to minimize this?!?!? ?,” Marlon Wayans tweeted. “We owe it to our children and our teachers to keep them safe while at school. Prayers won’t do this: action will. Congress, please do your job and protect Americans from senseless gun violence,” Kim K wrote. Is ANYFUCKINGBODY IN OUR WHITE HOUSE OR CONGRESS PLANNING ON TAKING ACTION TO TIGHTEN GUN LAWS!!!! How many mass shootings must we endure before something is done to minimize this?!?!?? Additional reactions to the shooting at Marjory Stoneman Douglas High School in Parkland, Florida are below.